“If you teach a poor young man to shave himself and keep his razor in order, you may contribute more to the happiness of his life than in giving him a thousand guineas.” This is a famous quote by Benjamin Franklin. This quote aptly outlines the importance of knowing how to shave. Shaving is an art and mastering this art can greatly enhance the shaving experience for both men and women who shave to remove hair. Always use a good quality razor for shaving. This small investment will save you a lot of trouble otherwise caused by frequent nicks and cuts, and will also ensure a better shave. The blade should be sharp enough, as a dull blade causes a lot more cuts and blotches on the skin besides being ineffective. 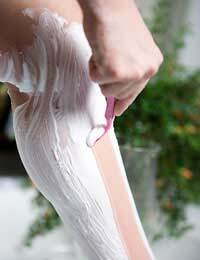 You can use a shaving gel, cream or foam for shaving, whichever you find suitable. Shaving gels are the most commonly used these days. Shaving creams require you to produce lather with the help of a shaving brush, and are thought to be better at moisturising the skin. Wash the skin with warm water or wet it with a warm towel for a few minutes. It would be ideal to shave during or after a warm bath. The warm water opens the pores, softens the hair making them swell up and stand erect, thus, facilitating an easier and more effective shave. If you are shaving this area for the first time or the hairs are long; you should trim the hair short before shaving. Apply the shaving gel to the skin and let it stay for a few minutes so that the skin becomes soft and any friction and skin irritation while shaving is minimised. Hold the skin taut while shaving. It is advisable to shave in the direction of hair growth, but, if you feel you need a closer shave, you can shave against the direction of hair growth too. Shaving against the grain runs a greater risk of razor burn, rash and ingrown hairs, so, if you do this, make sure that the skin is well-prepared for shaving by adequate moisturising and gel application. If your skin is particularly prone to ingrown hairs and razor burn, do not shave against the direction of hair growth at all. Don’t put too little or too much pressure while moving your razor along the skin. If the razor does not seem to work without too much pressure, it needs to be changed. Repetitive strokes on the same area can cause cuts, nicks or skin irritation, especially where the skin is sensitive. The strokes should be slow and short. Rinse your razor blade thoroughly and frequently while you are shaving so that the blade does not become clogged with hair. After shaving, rinse the area well with cold water to cool and soothe the skin and close the open pores. Dry gently with a soft towel. A moisturiser or after shave should be applied to the skin after shaving to reduce skin irritation, itching and dryness. Alcohol based, menthol based or perfumed products should not be used as they increase the chances of skin irritation and dryness. For a good shaving experience, change your blade frequently. Keep your skin clean and soft by frequent use of a soap free cleansing wash and a good moisturiser. If you use a gentle face scrub regularly, it will help to counter the problem of ingrown hairs. The more lather produced with a gel does not mean a better shave. Mounds of lather piling up may look exciting, but that’s all there is to it. A better shave is when more of the gel stays in contact with the skin surface so that the skin continuously stays satiny smooth and soft. Soap and alcohol based products dry the skin and compound the problem of dry skin further, so, should be avoided. Also, stay away from perfumes and deodorants immediately after shaving your underarm area. Nowadays, many people use the electric shaver for a fast, easy, convenient and non-messy shave. Both dry and wet type electric shavers are available. With an electric shaver, you can shave anywhere, anytime and the chances of cuts and grazes are negligible. With an electric shaver model of the dry/wet type, you can use the specialised pre-shave gels and lotions available to keep your skin soft, smooth and moisturised. It is a common notion that electric shaver does not give as close a shave as a razor blade does. However, this depends more on how correctly you use it. Clean your shaver frequently and follow the directions of use provided along with it. You will enjoy the shaving experience! What Shaving Products Are Beneficial?